Laparoscopy-assisted distal gastrectomy (LADG) for gastric cancer has been widely applied; however, its oncologic efficacy has yet been well established. The study aimed to compare the long-term oncologic outcomes of LADG versus open distal gastrectomy (ODG) on gastric cancer. 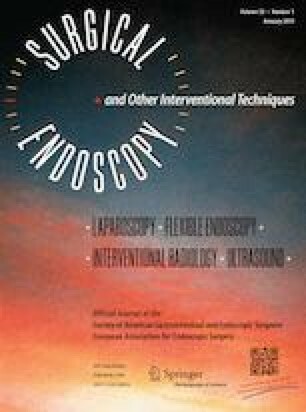 The clinicopathologic data of gastric cancer patients who underwent distal gastrectomy with curative intent from October 2004 through September 2014 were included and analyzed in a retrospective cohort. The last follow-up was September 2016. 769 eligible patients (LADG 414 vs. ODG 355) were included in the study. No significant difference was observed between the groups in 5-year DFS (LADG 61.2% vs. ODG 59.1%; p = 0.384) and OS rates (LADG 65.8% vs. ODG 66.3%; p = 0.750). During surgery, though LADG group had longer operating time, the blood loss was less than ODG group. LADG group had faster postoperative recovery course including shorter time to oral intake, ambulation, and discharge time. Postoperative complication rate within 30 days showed no significant difference between the groups (LADG 15.7% vs. ODG 13.0%; p = 0.281). Age over 65 years old, blood loss > 200 ml, postoperative complication, and advanced T and N stage were identified as independent risk factors for DFS and OS. LADG could yield similar oncologic outcomes compared with ODG in treating distal gastric cancer. However, the findings need to be further confirmed through ongoing prospective randomized controlled trials. Hao Wang and Tingyu Mou have contributed equally to this work and should be considered as co-first authors. This work was supported by the grants from the State’s Key Project of Research and Development Plan (2017YFC0108300, 2017YFC0108301), National Natural Science Foundation of China (81672446), Guangdong Provincial Science and Technology Key Project (2014A020215014), Research Fund of Public Welfare in the Health Industry, the National Health and Family Planning Commission of China (201402015), the Southern Medical University Clinical Research Start-Up Project (LC2016ZD003), Guangzhou Science and Technology Project (201400000004-5), and the Key Clinical Specialty Discipline Construction Program (170). Drs. Hao Wang, Tingyu Mou, Hao Chen, Yanfeng Hu, Tian Lin, Tuanjie Li, Jiang Yu, Hao Liu, and Guoxin Li have no conflicts of interest or financial ties to disclose.